Leading Manufacturer of multiple screw pumps, bridge breaking paddle screw pump, triplex screw pumps, mixing screw pump, eccentric screw pump and twin screw pumps from Chennai. The NETZSCH Multiple Screw Pumps (MSP) family has superior quality standards to meet the our customers highest level of requirements. With its own unique design, the NETZSCH Multiple Screw Pump is engineered to cover a wide range of applications. NOTOS® Multi Screw Pumps are designed to convey low to well lubricating fluids, low to high viscosity, shearsensitive or chemically aggressive media. The NETZSCH Bridge Breaking Paddle Screw Pumps have a superior quality standard to meet our customers highest level of requirements. With its own unique design, the NETZSCH Bridge Breaking Paddle Screw Pumps is engineered to cover a wide range of applications. For highly viscous, compacted and crumbly substances that have a tendency to bridge, our Bridge Breaking Paddle Screw Pump is the optimal solution. We can be used in nearly all branches of industry to provide continuous, pressure-stable, gentle and low-pulsation conveyance with dosing in proportion to rotation speed. The special features of this model include the patented, horizontally positioned feeding screw, the integrated bridge breaker and the enlarged rectangular hopper. Optimal feed into the conveying elements is guaranteed by means of the coupling rod with this feeding screw and the conical force-feed chamber. The bridge breaker prevents bridging and makes the mixing of aggregates possible. Applications: Drained sludge, filter cakes and much more. The NETZSCH NOTOS® Triplex Screw Pumps have a superior quality standard to meet our customers highest level of requirements. With its own unique design, the NETZSCH NOTOS® Triplex Screw Pumps is engineered to cover a wide range of applications. We offered wide range of Mixing Screw Pump. The proposed range is precisely designed by experts using high-grade raw material and advanced technology in compliance with international standards at the vendors’ end. 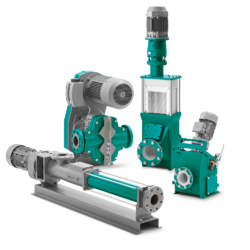 NETZSCH®Eccentric Screw Pump design can be used in any area of industry where a great variety of different substances must be pumped or very precisely dosed. We are the leading manufacturer and supplier of an excellent quality range of Eccentric Screw Pumps. These are applied in various industries, the Eccentric Screw Pump has been used as fluid transfer pump for years. These Eccentric Screw Pumps have the ability of pumping (or) transferring high and low viscosity products, with or without solids or long fibers, in suspension. The NETZSCH NOTOS® Twin Screw Pumps have a superior quality standard to meet our customers highest level of requirements. With its own unique design, the NETZSCH NOTOS® Twin Screw Pumps is engineered to cover a wide range of applications.